I am still somewhat new to souffles. I made my first one in a cooking class last year and I really think that is the way to go with such a tricky dish. Being able to see first-hand how everything looked as it was being made gave me the confidence to tackle this dish on my own. Since then I have made souffle a few times at home, even got bold enough to attempt it once for company. However, I still do not feel like I have it mastered. It still feels like a little miracle each time it actually works. 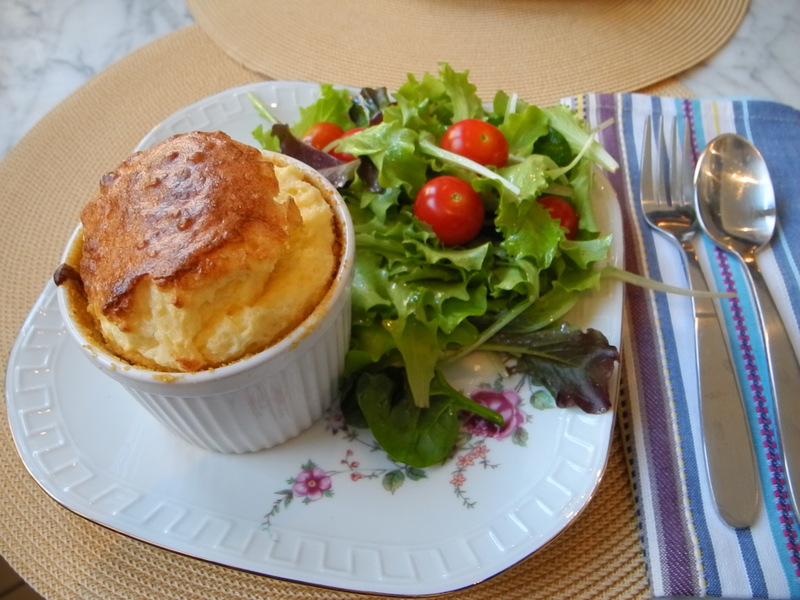 Which brings us to this week’s French Fridays with Dorie recipe, Cheese Souffle. Dorie’s technique was similar to other recipes I have used, but her proportions were different. The resulting souffle needed quite a bit longer in the oven than I was used to and seemed a bit moister in the end. Otherwise, it was quite good and made a delicious lunch. I’m looking forward to reading what everyone else has to say about this recipe and hopefully gleaning some tips from the pros in our group. This entry was posted in french fridays with dorie and tagged Around my French Table, eggs. Bookmark the permalink. They turned out beautifully and go perfectly with that fresh salad. Looks masterful to me. Miracle indeed! I love your mini-sized souffles. What size are your ramekins? Mine were only 6 ounces, so I wasn’t sure it would work, so made a big one. Individual servings is definitely the way to go on this one. I used 1 cup ramekins and probably could have made 8 individual souffles with this recipe. But I just made 6 and ended up tossing the leftover batter. A bit of a pity, but I don’t have a large souffle dish so it was my best option. I felt like it was a miracle when mine made it out with a bit of rise to it. (This was my first time). Your souffle & salad look beautiful! Great photo & I too usually feel like it’s pretty miraculous when things actually turn out how they’re supposed to – especially things like souffles and meringues! I’m so jealous your souffles stayed puffy during your photographing. Mine punked out and started to deflate. I had to do it VERY quickly, but since I’ve made souffle before I knew that I would need to be quick. 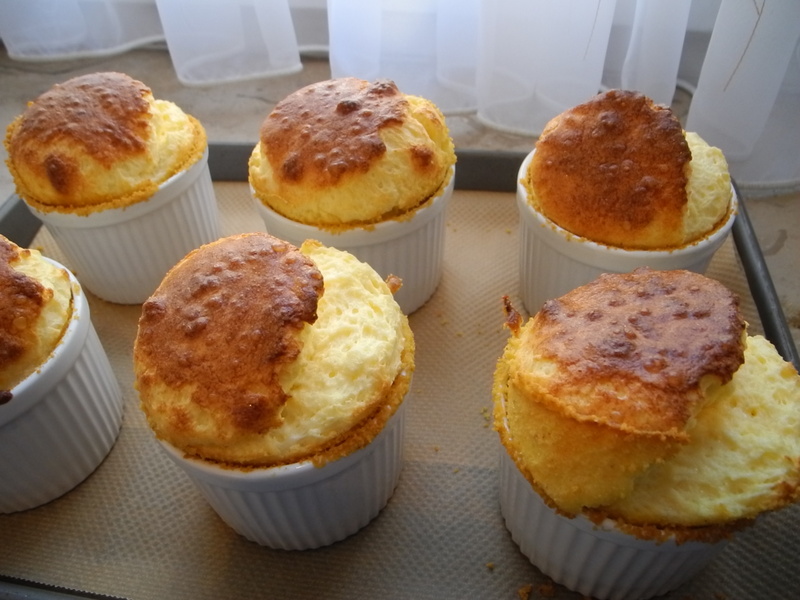 In fact, I had my husband take the souffles out of the oven so that I could be holding the camera the entire time and hopefully get a shot of them while they were still pouffy. Definitely not the easiest thing to photograph. When I made it, I used one big souffle dish, and I remember the center being a bit goopy. Moist would be a nice way to phrase it. We all sort of ate around the middle. Your souffle salad lunch looks delicious! Wow, they look great! I was going to use little ramekins but ended up doing the big souffle. I will try the individual ones when I make it next. Like maybe Easter brunch! Such absolutely beautiful souffles! They all look so perfect! I served mine with a salad, too! I think I will make individual soufflés next time! Kathleen…they would be wonderful for Easter Brunch! I made individual souffles too, and loved them (except for a little dripping over the side problem). Congratulations to all of us! My first time too. I was surprised it turned out so well and I served it with a salad as well. I have never tasted a soufflé before, and i just loved it, even leftover. Wonderful presentation. Your souffles are my favorite so far!!!! Your souffle lunch looks superb – I think the salad would break through the richness of the souffle. Rose, I think the soufflé is a miracle unto itself also. Unlike you, I don’t ever attempt to make soufflés but that’s going to change. Although mine was a bit more moist than I am used to eating, I liked that. Isn’t this what cooking with Dorie is all about – pushing ourselves a but in the kitchen? It certainly looks like a success! I’m glad we tackled this one – who knew it was so easy? Your plated souffle and salad looks fabulous. Great photo and I’m sure they tasted wonderful. Love the mini souffles. I think you are so right about watching someone cooking something before trying it yourself especially those things that are a little tricky. I agree it was a bit richer than the recipe I had been using from my mom all these years which had a lower egg yolk proportion. I didn’t mind though as I always end up wasting those yolks and I hate that. Great job! These look wonderful. Great photos, and, yes, even though I have not done souffle before, this did seem moist, and I wasn’t quite sure that it was totally done. It tasted good, though. All we can say is WOW! Yours are gorgeous. Love that you did individual ones. What a great idea for a dinner party, huh? Everyone would be so impressed! Very impressive looking souffles! I am sure they tasted as good as they look! Oh, those are simply lovely! Paired with a salad it makes a nice, elegant meal. I am looking forward to making this soon. Oh, my dear- they look beautiful! Yes, I agree with you that this soufflé seemed moist when dipped into- i even thought perhaps I had not cooked mine enough, but it was quite nice. And I do feel that a successful soufflé is a small miracle every time! Your little souffles are adorable, and they look delicious!